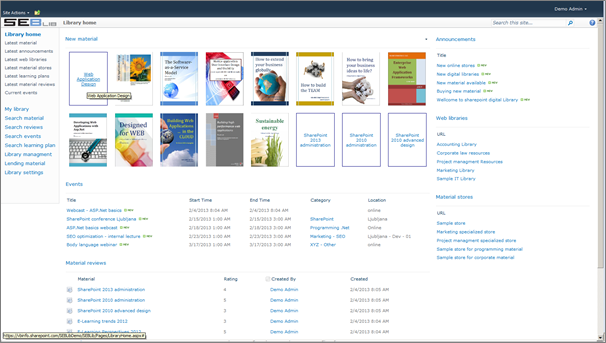 The SEBLib digital library offers you efficient sharing of books, audio, video and external learning material among teams and employees on your company intranet. You can get all necessary information about material that is available internally as well as guidance on alternative ways of obtaining material from external sources. You can provide links to popular web libraries and online stores, which is very useful for less skilled users and new team members. Knowing where to find it is half the battle of getting the material. SEBLib offers personalized pages to access your favorite material, reservations, loans and wish lists. You can find the desired material either by standard SharePoint full text search or in a more advanced way by specifying various predefined metadata fields (author, title, category, location etc.). In business organizations, material is often distributed among various teams as opposed to the classical library where material is stored in a central location. Lack of a central catalogue limits material availability. Using SEBLib, material is always close by for the people who need it most, and other users can get a valuable opinion on material from the person who knows it best. This can be a step forward to sharing knowledge and networking among otherwise isolated teams inside an organization. SEBLib is built as a site template for Microsoft SharePoint Server 2010 and as such it is integrated into your organization’s intranet portal offering you flexibility and extensibility included in the underlying document management and collaboration system. All data including attached digital material content is stored in standard SharePoint lists that can be easily extended to meet your needs by adding additional fields, new lists and external data sources. Site design, page navigation and web part arrangement can be changed very quickly. The library can be accessed with a web browser without any additional installations on the client computer. Use of standard SharePoint elements allows fast learning and easy adoption since users are already familiar with your SharePoint intranet portal. Depending on your permissions you can see various links in SEBLib main menu. Library home pages give you quick information about new library material, reviews, events, learning plans, announcements and links to external web libraries and online bookstores. Each of these pages is described in detail under its list description. Material lending pages allows you to manage reservations and loan of material. To view user’s loan select a user (enter user id or browse user lookup page) and all its reservations, borrowed and overdue material will be displayed bellow. To view material loan status select a material (enter material inventory number or browse material lookup page) and all users that reserved material will be displayed bellow. You can manage loan for selected material on its view page. 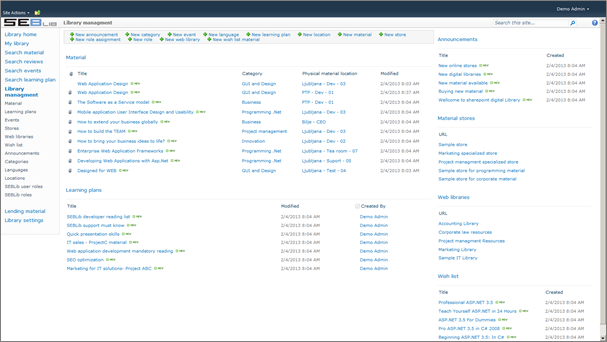 Click on the link with material title to open its view page and can see all available actions. For lending details see also “Material lending list” chapter. Library management pages enable you to manage all SEBLib content including material, learning plans, categories, locations, languages etc. 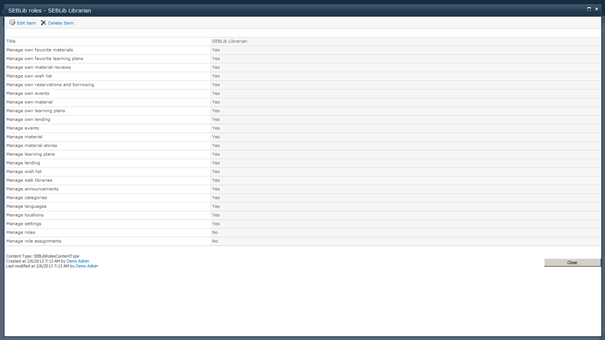 Depending on your user permissions you may see different actions in the SEBLib actions menu. Library settings page allows you to manage SEBLib setting. · Category refresh – displays information when categories were last refreshed. · Location refresh – displays information when locations were last refreshed. · License information – displays installed SEBLib licenses information. To add/remove licenses click button Edit licenses. 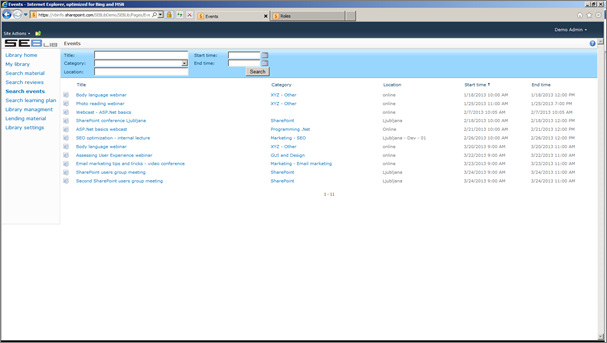 · UI customization for administrators - allows administrator to temporally disable user interface customizations included in SEBLib for his own needs. Other users are not affected by this feature. 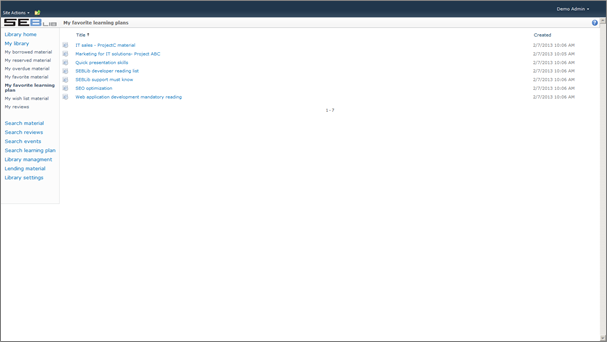 SEBLib hides some standard SharePoint links and buttons which are not relevant to SEBLib logic, but may be useful for administrator to perform additional customization of site. · Installed SEBLib version – displays information on currently installed SEBLib version. To see if new version is available press button “Check for updates”. On top of standard SharePoint permissions, SEBLib adds another layer of user permissions which allow you to more precisely define various groups of users and their available actions. Permission templates are stored in the SEBLib roles list and are assigned to users and groups through “SEBLib user roles” list. Validation of user permissions on add/update/delete is implemented using event receivers on all SEBLib lists. SEBLib does not place any additional limitations on read access to list items. Event receivers are enabled by activating “SEBLib 2.0 Event Receivers” feature. To disable them deactivate this feature. SEBLib supports various user roles and depending on your permissions you may gain access to different functionality. Roles are defined in SEBLib roles list. SEBLib Visitor can view all site content, but can only manage own favorite materials, own reviews, own wish lists and own favorite learning plans. SEBLib Member can perform all actions available to “SEBLib Visitor” plus can manage own material, lending, learning plans, web libraries and material stores. SEBLib Librarian can manage all site content with exception to Site settings and User role management which is only available to site administrators. See also SEBLib roles chapter for additional information. 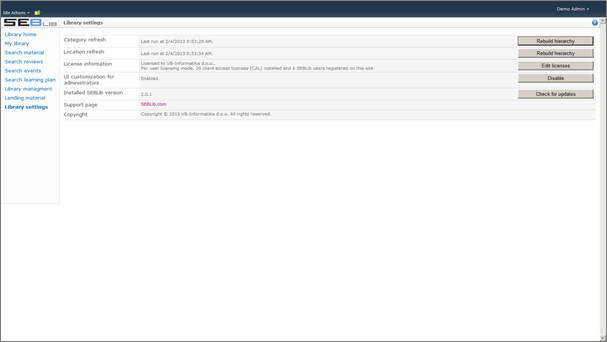 If you want to customize SEBLib you should first temporarily disable SEBLib customizations. Go to »Library settings« and click »Disable« in the »UI customization for administrators« row to show SharePoint standard toolbars. 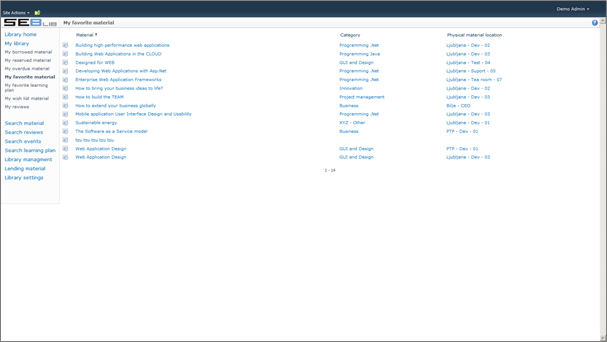 You can make your changes using SharePoint designer. 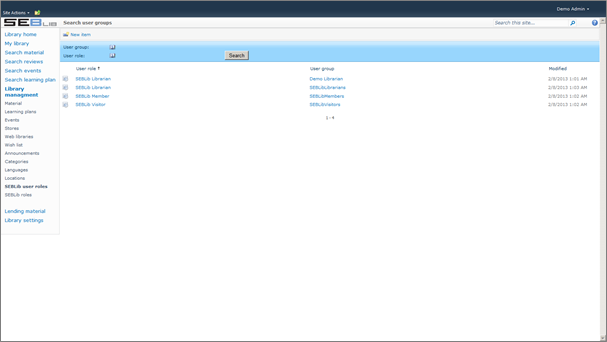 When done you should enable the »UI customization for administrators«. When upgrading SEBLib to a new version all replaced files are backed up to “Upgrade” subfolders and you can merge your changes with new files after upgrade. Purpose of announcements is to inform all users about latest news and provide instructions regarding use of the library. 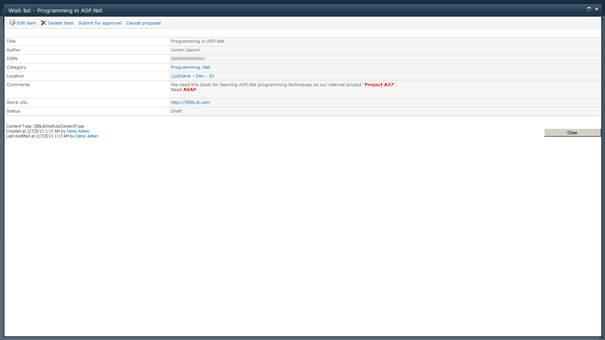 Users with “Manage announcements” role can edit all items using “Library management”->”Announcements” page. This list contains all categories that can be assigned to a material list item. Categories are hierarchical. Each category can be assigned a parent category and can have several child categories. • Category hierarchy – position of category inside of the hierarchy presented as a sequence of parent IDs separated by ".". Calculated internally by SEBLib. • Indent number – identifies hierarchy level; depth from the source category. Calculated internally by SEBLib. • Indented title – calculated as "title" prefixed by number of "indented" spaces. Used for display in some drop down lists. • Row order – absolute position of category within the list. Calculated internally by SEBLib and used for sorting. • Numbered title – calculated as "title" prefixed by "category hierarchy". Used in views for display. Note: Category hierarchy, indent and hierarchy row order are calculated internally when you click button “Rebuild hierarchy” on pages “Library settings” or “Categories” search page. If you experience problems with the indented title and hierarchy display, go to settings page and click “Rebuild hierarchy” button. 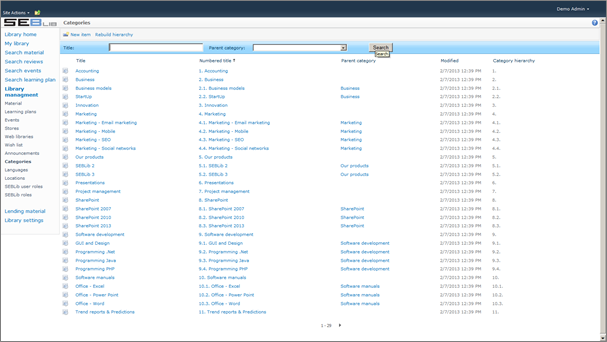 Users with “Manage categories” role can edit all items using “Library management”->”Categories” page. This list stores calendar of events like internal lectures, webinars, online courses, etc. using this list you can share with your colleagues’ information about incoming education events you receive by email or you found on the internet. 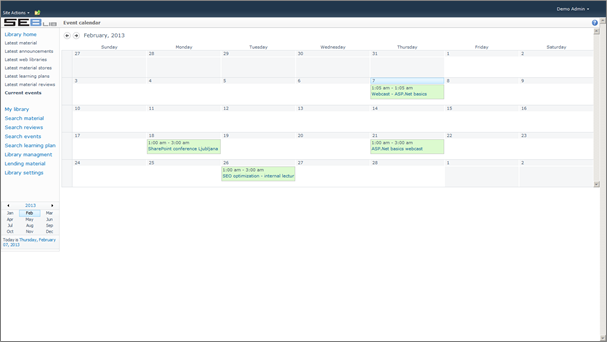 Users with “Manage own events” role can add and edit their items using “Library management”->”Events” page. Users with “Manage events” role can add and edit all items using “Library management”->”Events” page. To search all events you can use “Search events” page. To find current events you can also see Events calendar page. This list contains favorite learning plans for all users. 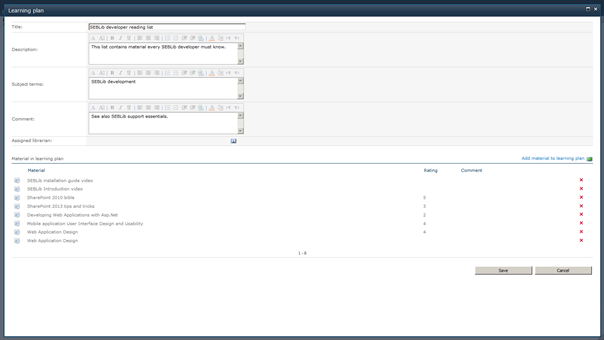 Management of favorite learning plans (adding / removing) is available on learning plan view page. Users can access their favorite learning plans using “My library”->”My favorite learning plans” page. Only users with “Manage own favorite learning plans” role can manage their favorite learning plans. This list stores links to favorite material for all users. When users click on a link to their favorite material, they are redirected to the detailed view of the material. There they can perform various actions including adding and removing material from list of favorites. Users can access their favorite material using “My library”->”My favorite material” page. Only users with “Manage own favorite materials” role can manage their favorite material. This list contains languages that can be assigned to material list items. It represents the language in which the material item is written. 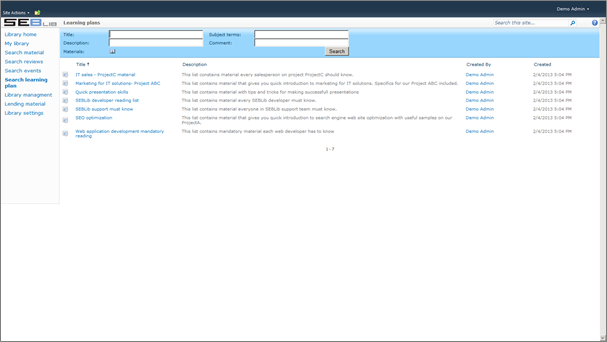 Users with “Manage languages” role can add and edit all items using “Library management”->”Languages” page. A learning plan contains material that should be known to a group of people. For example if everyone in marketing team should know how to use Excel, Outlook, Dynamics CRM and should be familiar with social networks then you can simply create a learning plan “Marketing basics” and add relevant material to the plan (video, books, etc.). You can add new learning plan using “New learning plan” action on “My library” and “Library management” pages. Users with “Manage own learning plans” role can add and edit learning plans where they are defined as “Assigned librarian” or this field is empty. Users with “Manage learning plans” role can add and edit all learning plans. Users with “Manage own favorite learning plans” can add a learning plan to theirs favorite list. This page allows you to find learning plans using various predefined filters. Learning plan view page displays information about learning plan and material included in it together with current user ratings of material. This way you can always know what material you already know and what you have to read / watch / explore / study. Learning plan add/edit page allows you to manage learning plans. The lending list stores data about material lending and is used for borrowing and reserving material. · “Manage own lending” – can perform all lending actions on material where user is set as “Assigned librarian”. Users can view their reservations, borrowed and overdue material using “My library” pages. 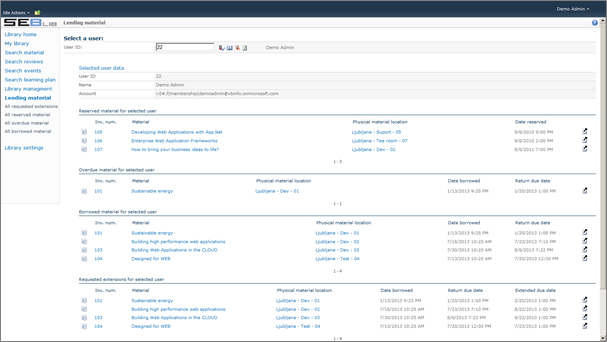 Actions for managing loan and reservations are available on “Material view” page. They are displayed only to users with appropriate rights. To manage user loan open “Lending material” page and select a user (enter user id or browse user lookup page). To view material loan status open “Lending material” page and select a material (enter material inventory number or browse material lookup page). The list of locations contains places inside your organization where physical material is located. Locations can include an office, a department, a team etc. Locations are hierarchical. Each location can be assigned a parent location and can have several child locations. • Location hierarchy – position of location within the hierarchy presented as a sequence of parent IDs separated by ".". Calculated internally by SEBLib. • Indent number – identifying hierarchy level – depth from the source location. Calculated internally by SEBLib. • Indented title - calculated as "title" prefixed by number of "indented" spaces. Used for display in some drop down lists. • Hierarchy row order – absolute position of location on the list. Calculated internally by SEBLib and used for sorting. • Numbered title – calculated as "title" prefixed by "location hierarchy". Used in views for display. Note: Location hierarchy, indent and hierarchy row order are calculated internally when you click button “Rebuild hierarchy” on pages “Library settings” or “Library management”->“Locations” search page. 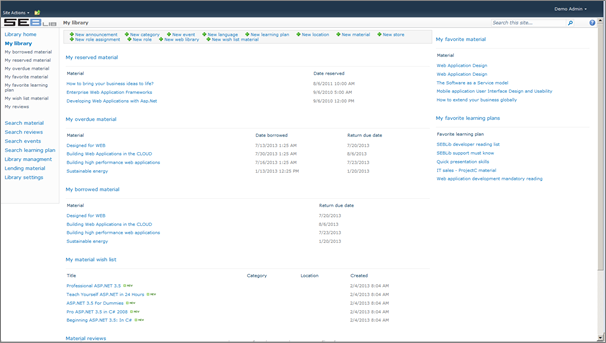 Users with “Manage locations” role can edit all items using “Library management”->”Locations” page. The list of material stores all data about physical and digital material in the SEBLib library as well as URLs and embedded code for external material from the internet. 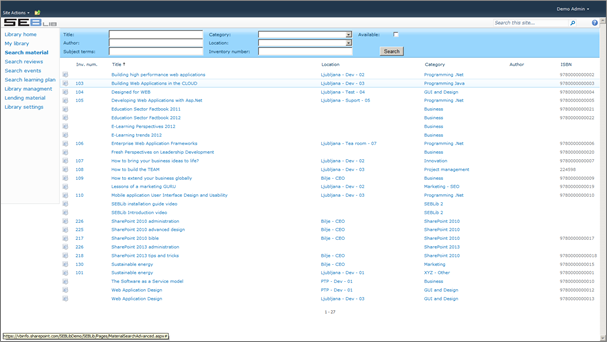 Search page offers advanced material search by various metadata fields including hierarchical categories and locations. 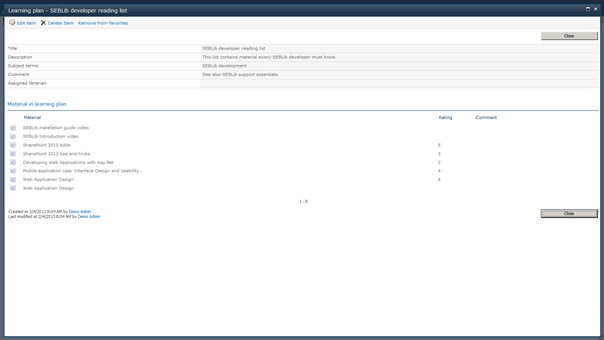 Material view page displays information about the material along with all attachments that we have enclosed. If we have attached at least one image, the first loaded image is displayed as the cover. In cases where material is marked as »physical material«, additional information is displayed regarding lending status indicating whether the material is available or currently on loan to a user. There is also a list of material reservations made by users who wish to borrow material. A list of all reviews is displayed at the bottom of the page. • Add to favorites: adds material to list of favorite material and displays it in the »My favorite material« section. • Remove from favorites: removes material from favorites list. • Borrow material: loans selected material to a user. • Return material: returns borrowed material. • Reserve material: places reservation on selected material for current user. List of reservations serves as a recommendation to the librarian who then has the discretion to decide who will get the material next. • Cancel reservation: removes current user from the list of selected material reservations. • Request extension: allows you to ask for an extension of the loan period. • Accept extension: approves proposed extension of loan period. Materials add/edit page allows you to add and edit material in SEBLib library. To add new material, open the library management page and click the “Add material” button in SEBLib actions menu at the top of the page. 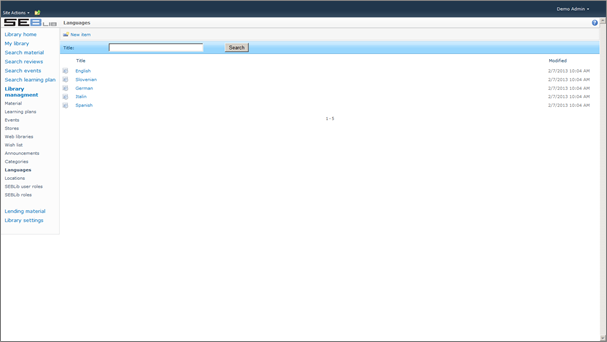 To edit existing material, open the material search page and locate the desired material. 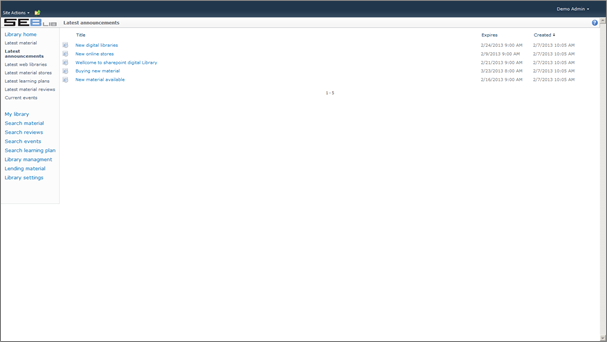 Then click on the desired row title link to open its material view page. On View page choose the “edit item” command. After you make necessary changes click on the “OK” button to save your changes. Depending on the type of material you are adding, you may choose which fields you will enter. Only fields with values will be displayed on view page. • Category – hierarchical material category from list of categories. • External content embed code – when adding external audio / video you can enter html embed to make external content part of material page. Before using this option make sure you trust the source of external content and talk to your administrator due to possible security risks. • Physical material location – identified location where physical units are stored. It is only relevant for physical material and can be selected from the list of locations. • Cover image url – url to one of attached images. It is displayed on home page material list and on material view page. Whenever you read a book or watch a video you can write a review in the library. You can keep track of what you already studied and your opinion can be helpful to your team members. Users with “Manage own material reviews” role can add and manage their own reviews. To add a review for selected material open “Material view” page and use “Add review” command. User can access their own reviews using “My library” -> “My reviews” page. This list shows links to online material stores where your organization purchases new material. Users are encouraged search these sites for all material they need that is not already in the library. When material is located, it can be added to the wish list where librarians can check it and purchase it. These links are also useful as a guide for less skilled users to obtain new material. All users can access Material stores on “Library home” page. Users with “Manage material stores” role can edit all items using “Library management”->”Material stores” page. Users can propose purchase of additional material using material wish list. 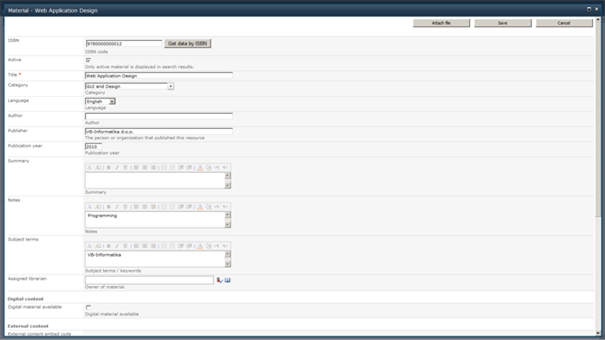 · “Manage own wish list” – user can add, edit, submit or cancel own proposals. · “Manage wish list” (wish list manager) – user can manage all wish list proposals (Approve, Reject, Order and Include in library). · "Draft" – item has been created and user can edit it. At this point user can choose “Submit for approval” or “Cancel proposal”. · “Submitted” – Proposal is waiting for approval by wish list manager. · "Proposal canceled" – user canceled proposal. · "Material included in library" – item is available and has been added to SEBLib material. All users can access their proposals in “My library” -> “My material wish list” page. 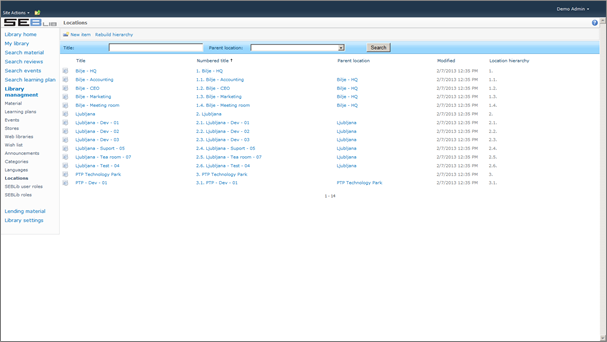 Wish list managers can access full list using “Library management”->”Material wish list” page. This list stores links to the most popular web libraries for your organization. The purpose of this list is to facilitate user’s access to material that is located outside of the organization either in the public digital libraries or in classical libraries to which your organization has access. Many digital libraries and portals on the internet contain free material, but users often do not know where and how to find them. With the help of this list, all users can be informed where and how to find desired material with as little effort as necessary. All users can see web libraries on “Library home” page. 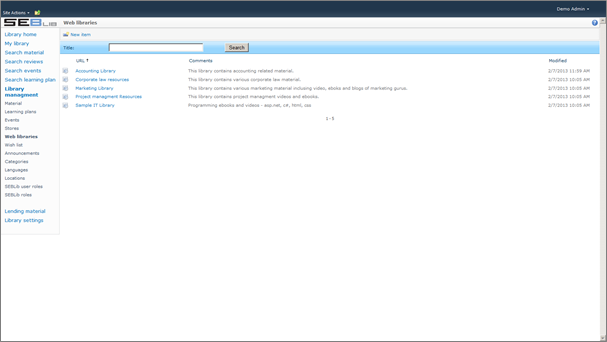 Users with “Manage web libraries” role can edit all items using “Library management”->”Web libraries” page. Users can add and remove materials from their own favorites. Users can add and remove learning plans from their own favorites. Users can add, edit and remove their own reviews. Users can add, edit and remove their items from wish list. They cannot manage other users’ items or approve purchase. Users can reserve material, cancel reservation or ask for loan extension. Users can add, edit and remove events they created. Users can add, edit and remove material where field “Assigned librarian” is empty or assigned to them. Users can add, edit and remove learning plans where field “Assigned librarian” is empty or assigned to them. Users can loan material where field “Assigned librarian” is empty or assigned to them. Users can add, edit and remove all events. Users can add, edit and remove all material. 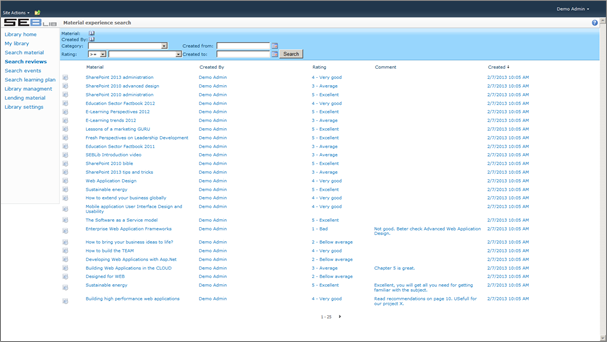 Users can add, edit and remove all material stores. Users can add, edit and remove all learning plans. Users can perform all loan actions. Users can add, edit and remove all wish list items and perform all status changes including approval of purchase. Users can add, edit and remove all web libraries. Users can add, edit and remove all announcements. Users can add, edit and remove all categories. Users can add, edit and remove all languages. Users can add, edit and remove all locations. Users can add, edit and remove all roles. Users can add, edit and remove all role assignments. 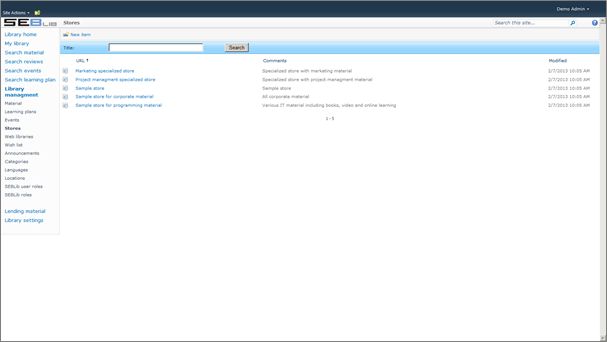 Users with “Manage roles” role can edit all items using “Library management”->”SEBLib roles” page. SEBLib User role assigns a “SEBLib role” to selected user or group. User can be assigned multiple roles. 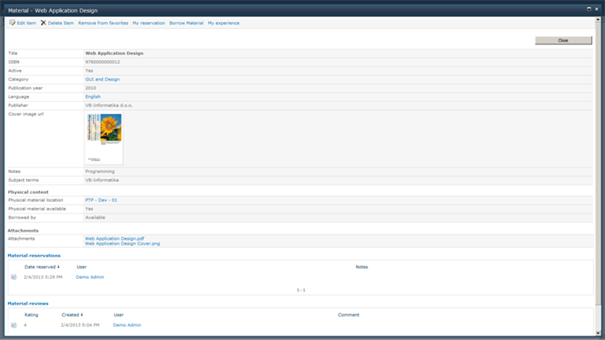 Users with “Manage roles” role can edit all items using “Library management”->”SEBLib user roles” page.